My ears pricked up when I heard that the next episode of the Apprentice would involve developing and marketing a range of beauty products. I am a big fan of this programme anyway, but the subject matter made this one that was not to be missed. Beauty products aren’t like new cars or operating systems, but nonetheless you can’t develop them in a day so I was intrigued as to how they were going to go about it. In the event they found a friendly cosmetic company, easily identifiable to those in the business, to offer up some bases that could be fragranced with essential oils. This was quite a neat way of making a programme for the telly but does leave the most interesting bit of the whole process out. So all the competitors had to come up with was an essential oil blend to make the product smell nice, a suitable colour, a ‘natural ingredient’ to give it a marketing story and to design a label. It was not too different to the real process really – including the problems that routinely come up in product development. One of the teams spent ages on the design of the packaging while ignoring the costs of the raw materials. Yes, I have been there. 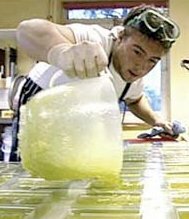 The other team, despite being led by a chemist who ought to have known better, tried to put a liquid – honey – into a bar of solid soap. Needless to say, the honey remained liquid. The only unrealistic bit of the show was when team members decamped out of the manufacturing plant to gather natural ingredients. Entertaining as it was to see a very large bloke on a beach obviously terrified of crabs, this is in no way true to life. The so called natural ingredients used in cosmetic products are produced on an industrial scale by companies who make it their business to supply these materials. That’s why you don’t see employees of Clairol out gathering herbs for the Herbal Essences shampoo or people from Cuzzons picking mint for the Original Source. Still it was good for the show to have some outside footage. I was quite impressed with the Rock Poole idea for the brand name of one of the offerings, and the same team did a pretty good job of making the product look pretty good with an attractive label and a nice colour. The other lot were rather less inspired and as I have said, had severe quality problems with their soap. It was also impressive that both teams managed to shift all their stock – one team with a judicious trade sale at the end of the day and the other by slashing prices to almost give the stuff away. All in all it was good fun to watch. Casual viewers would have laughed at the huge costing error the losing team made by mixing up cedarwood oil and sandalwood oil. This cost them the task, even though they sold more products at higher prices than the others. Well I couldn’t help but remember a few instances from my own career where the professionals weren’t a huge deal better. If you have been inspired by the success of the participants in this show to try your hand at launching your own range of cosmetics there are a few things you will need to bear in mind that were glossed over in the show. First off, you need to be sure the product is both safe and stable. You need to be pretty confident it isn’t going to be a place where germs can multiply. If the product contains water this will usually mean a challenge test. You ‘challenge’ the formulation by deliberately injecting it with microbes, and then storing it to see if they grow. There aren’t any official criteria for how well preserved your product needs to be, but nearly everyone uses the pharmaceutical industry’s standard published in the European Pharmacopeia (there is a near identical US one). Basically if your product doesn’t pass this test you may not be strictly breaking the law, but if you end up in court you are going to have to come up with a really good reason why you didn’t follow the industry standard. There aren’t any particular standards for how long your product needs to be stable for either, but you do need to be sure you can justify what you do. Another thing you need is a PIP file. PIP stands for Product Information Pack -some people call them PIF files, for Product Information Files. These are simply the formulation and all the relevant data on the safety. One requirement is that causes very small producers problems is the need for products to be assessed for safety prior to release by a suitably qualified person. In principle this is a pretty sound idea, requiring companies to make sure that someone who knows what they are talking about has had a look at a product before it gets released onto human beings. The only trouble was that when the legislation first came into force it didn’t define who a suitably qualified person was. A subsequent revision added that suitably qualified people included doctors, pharmacists, chartered chemists and chartered biologists. I am not sure that this gives those four classes of people carte blanche to approve cosmetics for use even if they don’t have expertise in this area – though having read the legislation it does sort of read that way. The omission of toxicologists from the list is curious. I know a number of companies who offer assessment of cosmetic products for a fee, and most of the people who do the assessing seem to be toxicologists. Toxicology would seem to be the most obvious discipline to give a good background to that kind of job. There is nothing to stop a company doing its own assessment if it has a suitably qualified person on the staff, but getting it assessed independently is useful. It means the assessor has no bias. Also, given that the assessment is supposed to be carried out before the product is launched the invoice provides a useful proof of the date the assessment was done. There are a couple of other things you need to sort out – but this is already a long post. Let me know if you are interested and I can come back to this subject. The makers of the Apprentice got round all these issues quite neatly by using pre-formulated bases for which all the stability and micro data had already been generated and the safety already assessed. I am sure that a couple of regulatory professionals I know were probably tutting away to themselves about the fact that they wouldn’t have had exactly the formulations used assessed. I doubt that trading standards would be that strict though. All in all it was a very enjoyable programme and I would love to get my hands on one of the products that they made. This entry was posted in Beauty News, Legislation and tagged legislation, personal care products, toxicoogy on April 21, 2009 by Colin. I know this is an old blog but I was wondering if you know the name of the manufacturing plant where the contestants produced the beauty products in this episode or whether you could recommend some manufacturing plants to me. I have an idea to produce organic beauty products but don’t know of any manufacturers who could help make my products at the momen. Could you please help. If you are doing an organic range a good starting point would be to get in touch with the Soil Association. They approve a number of cosmetic contract manufacturers and you can find their contact details if you download the pdf file at the bottom of this page on the Soil Association website. The Organic Farmers and Growers Association runs a similar scheme and would probably be able to supply a similar list if you ask them, but I can’t find it on their website. Best of luck and let me know how you get on. Hi Magy, I am afraid there really isn’t such a list. It would be good if there were. I’ll e-mail you privately for more details of what you are doing and see if I can point you in the right direction. I found your blog really useful…I am looking to start an online business on an essential oil and it would be great if I can ask you questions which can help me…there is an oil I want to import for my beauty and wellness business and just want your expertise if that’s okay. I will look forward to hearing from you. Thank you.